Actor Mouni Roy is one of the most sought-after divas in Bollywood currently. The actress, who rose to fame with her stint in Hindi TV show, Naagin, has today got many interesting Bollywood projects in her kitty. The actress is not just popular for her stunning on-screen presence but also for being a terrific dancer. Now that the season of Bollywood awards is here, the fans can see Mouni setting the stage on fire. The actress has taken to Instagram to share a glimpse of her dressed up to perform at a function. 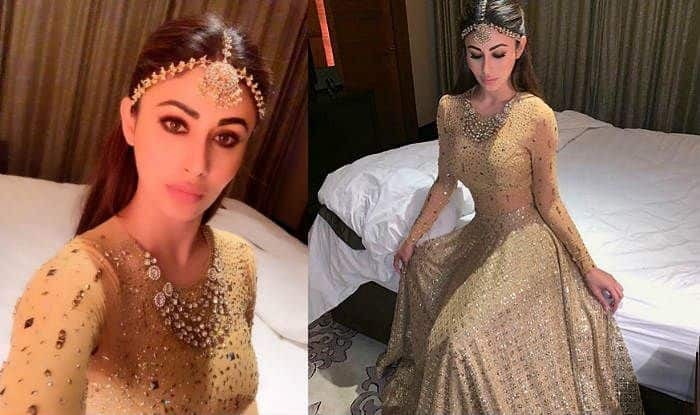 Mouni has posted a few pictures of her wearing a sparkly golden lehenga with some heavy kundan jewellery. While the details of the event where Mouni has performed aren’t out yet, the actress does look fabulous in that traditional outfit. Posting the pictures on Instagram, she wrote, “So the last time I thought ‘the last dance this year’ ; it wasn’t !! Mouni also performed at the recently happened Star Screen Awards 2018. The actress was also seen walking the red carpet at her friend and producer, Dinesh Vijan’s wedding reception. She wore a gorgeous powder blue coloured Mayur Girortra lehenga at the party. In fact, Mouni has been giving a lot of traditional appearances of late, courtesy the wedding season. Her pictures wearing a red fusion outfit recently went viral on the internet, leaving her fans in awe of her. On the work front, Mouni has got Made in China with Rajkummar Rao, and RAW: Romeo Akbar Walter with John Abraham, next year. She has also finished shooting for Ayan Mukerji’s Brahmastra, which also features Ranbir Kapoor, Alia Bhatt and Amitabh Bachchan in other important roles. The actress made her Bollywood debut this year in Akshay Kumar starrer Gold. Your thoughts on her latest look?